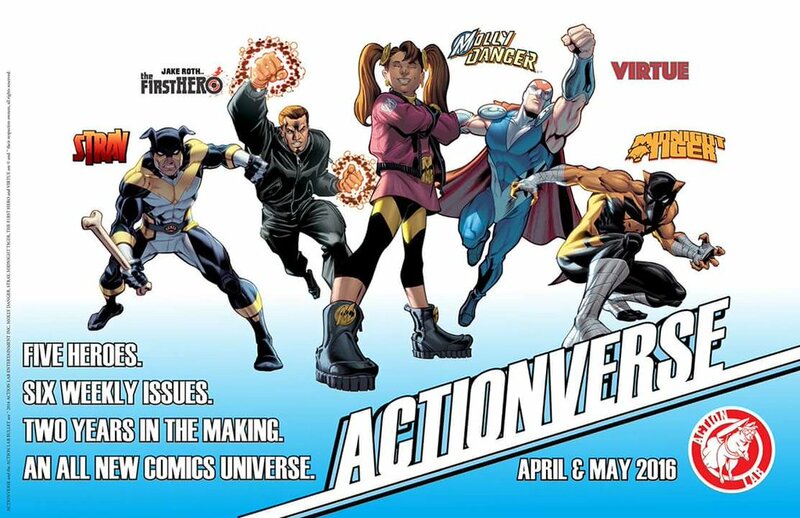 This Wednesday, independent publisher Action Lab Entertainment is launching an unprecedented event; crossing over several of their creator-owned titles and launching them into a shared universe in the mini-series, Actionverse. “If you are tired of retreads, reboots and reheats of the same old same old, try some FUN in your comics!” is how the company is promoting the series and it couldn’t be more spot on. The entire Actionverse team sat down for a roundtable discussion of the series and it’s origins and what to expect. Special thanks to series editor Vito Delsante for helping to coordinate this discussion. Participating in this discussion are Vito Delsante, series editor, writer/co-creator of Stray; Jamal Igle, writer/artist and creator of Molly Danger; Sean Izaakse, artist, co-creator of Stray; Anthony Ruttgaizer, writer, creator The F1RST Hero; Shawn Gabborin, writer, co-creator of Virtue from Fracture; Chad Cicconi, artist, co-creator of Virtue from Fracture; Ray-Anthony Height, artist, creator of Midnight Tiger; Nate Lovett, series colorist, and Steve Walker, artist. FOG! : Before we dive into the comic event, can each of you tell us about your characters (who they are, powers, etc)? Vito Delsante: Stray is Rodney Weller, the former sidekick of the now deceased Doberman (he was called the Rottweiler then). He was a member of Aegis, a super-team, the founder of the TeenAegis (aka the Teen Agents), and he and Molly Danger used to team up often. He quit when he and his father had a…difference of philosophy (PLUG: See Stray Volume 1). He has two primary powers (I’ll lean on Sean to correct me if I’m wrong here). One, he has a healing ability that only kicks in when his body is taxed to the limit. He has learned to take a lot of punishment as a result, but when his body can take no more, it shuts down and leaves him EXTREMELY vulnerable as he heals. His other power is he has an aura projection that is extremely low level, and he’s almost unaware of it (although he uses one aspect of it in Actionverse #0). When he gets angry, he can project a fear aura, but when he’s feeling good about himself, feeling positive, he can project an inspirational aura. He can rally folks around him just by believing in himself. Sean Izaakse: Pretty much all the things Vito said. To elaborate more on Rodney’s second ability, it’s sort of a type of subconscious emotion manipulations power, which he hasn’t mastered or really used up till this point. But he can comfort the fearful and he can scare or instill fear in his opponents. He just needs to figure out how it works, which could be a story in itself down the line. Chad Cicconi: I’ll leave the heaving lifting on this question to Shawn Gabborin, as he wrote the series. Suffice it to say that the two main characters from Fracture that play a big role in the Actionverse mini-series are Cascade (formerly the imposter Malice, from the first volume of Fracture). He’s a very smart and cunning guy with a lot of technology. And Virtue, who is a first-order prototype hero with a capital “H” who can fly, be infuriatingly invulnerable, and punch the snot out of you. Anthony Ruttgaizer: Jacob Solomon “Jake” Roth is the only person on his Earth to ever manifest “extrahuman” powers but NOT go insane. Jake was a Marine stationed in Afghanistan when, during combat, his “extrahuman” powers exploded to life, saving him from certain death. Jake returned home to his civilian life only to find himself drawn into the blossoming war between law enforcement and the growing ranks of extrahumanity that are being drawn to his hometown of Philadelphia. Jake emits an energy field that grants him strength and limited invulnerability. The source of that energy is unknown… until Actionverse! 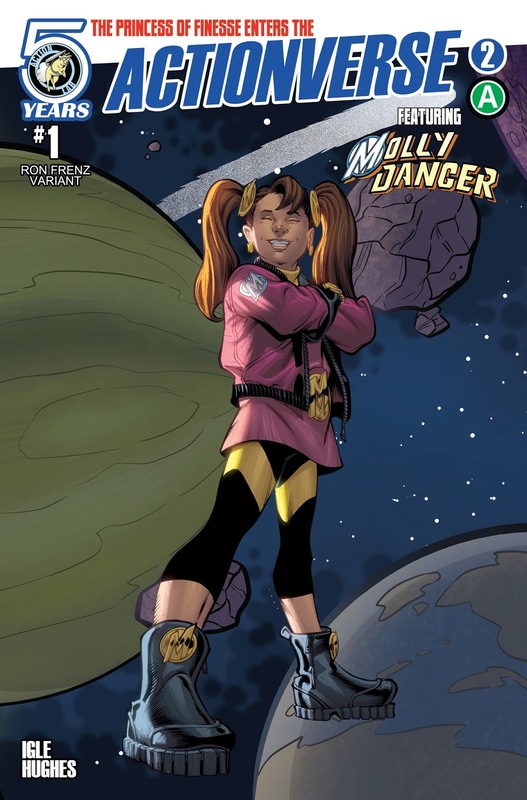 Jamal Igle: Molly Danger.. The Princess of “Finesse”, The Pint-Sized Powerhouse. She’s a superhumanly strong, practically invulnerable and possibly immortal ten year old hero. She’s spent the past two decades as one of the most famous heroes in the world. Smart, brave and mischievous, Molly is the elder statesperson of this group. However, being the most experienced isn’t always a plus for her. Ray-Anthony Height: The young teenage sensation Midnight Tiger aka Gavin Shaw. After saving the life of the hero known as Lionsblood, Gavin awoke the next morning in a hospital bed. The teenager would soon discover that Lionsblood, in an effort to save the boy’s life, had to inject him with the same serum that gave the hero his powers. Finally having the means to do something and wanting to put his newfound abilities to good use, Gavin becomes the crime-fighter known as Midnight Tiger and begins his assault on the gangs and drug dealers of Apollo Bay. Basically, Gavin is a superhumanly powered big cat, like his namesake; Agility, Senses, Retractable Claws, Incredible Strength, and Accelerated Healing. However, some might say his greatest power is his vast knowledge of superheroes and superhero lore. Part-time fan boy, full-time superhero historian who uses that knowledge like a weapon. Shawn Gabborin: In the first volume of Fracture, we met an average guy named Jeff. Turns out he’s not so average. He has multiple personalities, one being the city’s greatest hero in Virtue, and another being Virtue’s arch-rival Malice. When Jeff found this out, he tried to take control of the situation… leaving the Malice costume and gadgets free for his best friend Kyle to pick up in an attempt to take on the mantle. That didn’t go so well for him, which leads in to where Actionverse picks Kyle up. All of these characters existed in their own titles. When did the idea of them sharing a universe begin and what were your thoughts about having your characters be part of a larger world? Vito: I don’t know if we’ll all agree on this, because there are a few different ways to interpret how this happened. First, we were all approached by former president of Action Lab, Kevin Freeman, to do a mini-series that would begin with 2015’s Free Comic Book Day. In fact, there were a few others who were approached that declined! I think Bryan Seaton (the CEO of ALE) coined the phrase “Actionverse” first, although that became our shorthand very early on and it’s possible that one of us said it first. 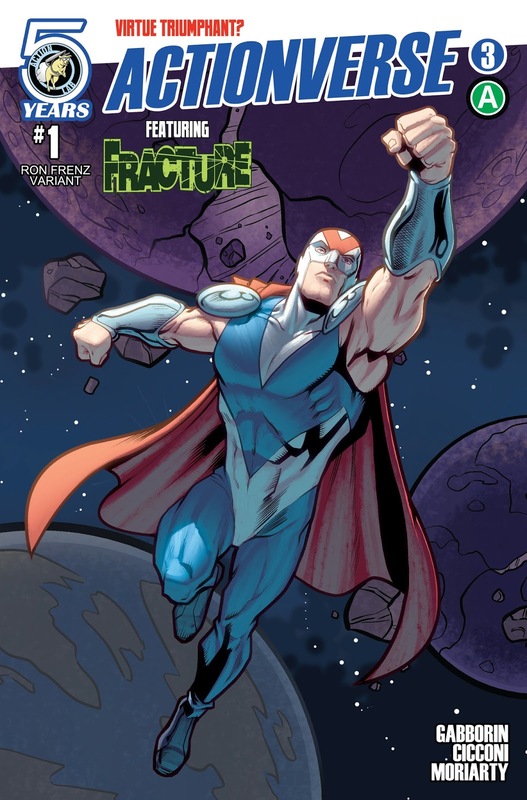 You can also say that the seeds for Actionverse were planted by Chad and Shawn when Fracture, basically, established Action Lab (the company) and was the first book carried by Diamond. But the common origin starts with Ray-Anthony Height and me, when we were creators at Ape Entertainment. We were big fans of each other and had this…unwritten rule that no matter what we do, no matter where we go, our superhero comics always exist in the same universe. Chad: I was brought into the fold on this project some time after its inception, so I can’t say what the genesis was. 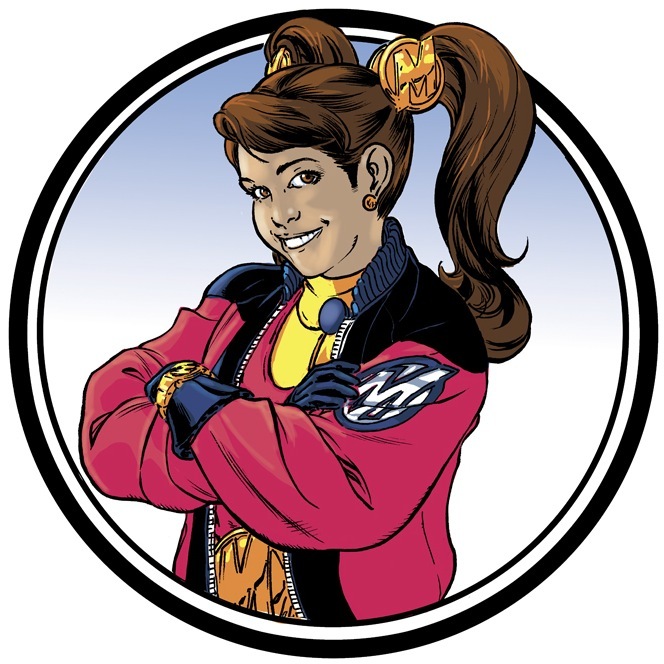 My understanding is that it grew from an original idea involving Stray, Midnight Tiger and Molly Danger, and after several brainstorming sessions, grew to include other properties that had the commonality of Action Lab. When I found out Fracture was going to be a part of the series, I was thrilled, as it gave me a chance to work on a project with so many others, which was a new experience for me. Anthony: I was a johnny-come-lately to this party but I thought the idea of a crossover was tremendous but I had to voice my concerns immediately about the idea of a shared world. The very premise of The F1RST Hero means that there can’t be any other super-powered heroes on Jake’s world. With that in mind, we worked out tweeks to the then-existing plot that gave Jake his own world and incorporated interdimensional travel into the story. Luckily, I had a great group of collaborators who allowed me to join the party and have so much influence over how the series would unfold. Sean: And I think that having that sort of glitch, for lack of a better word, to overcome, to bring the world of The F1RST Hero into the crossover, actually worked for the story and made it grow into something even bigger than we expected. And the story is definitely better for it. Jamal: Once we figured that out, everything else started to lock into place. Although there were still other issues that had to be worked out, as far as the actual story went. Ray-Anthony: In the end, it all seemed to work out. Everyone’s individual titles and characters were very well respected within the story and though we all have our own ultimate goals for our titles, we all have a more open world to draw from if we’d like. Shawn: It’s great to have characters from Fracture involved! It’s been a lot of fun to see the other creator’s takes on Virtue and the development that Cascade goes through! What challenges were there in re-thinking your world as being part of a shared one? Did you have to rethink anything? Vito: A few. Nothing we couldn’t compromise on or work through. Chad: Again, I’ll have to leave this one for Shawn. I’m just the art monkey. Shawn’s script for our issue was pretty well formed when it landed on my desk. I know he had plans for the fate of the characters of Fracture who ended up in this story, but I have no idea how close this ended up to his original vision. Anthony: As I mentioned, the high concept at the core of The F1RST Hero kind of dictated how much “rethinking” I could do. What I will say is that the needs of the Actionverse plot helped define the biggest unknown about Jake’s powers. Vito: I think this was the only true hurdle. Both The F1RST Hero and Fracture, as books, exist in worlds that, based on what came before in their respective volumes, had to have a sense of exclusivity to them. At one point, the story involved doppelgangers on the individual worlds, and that still shows up briefly (in the Molly Danger issue), but it complicated the story, somewhat, and the guys (rightly) challenged me on that, and we just made our original story work better for what we were trying to do. I think that my relationship with Ray made our shared universe work because, like I said, that was always our goal. Jamal and Molly, once the four of us (Jamal, Ray, Sean and me) put our heads together, was really easy; it was like a missing puzzle piece. Actionverse #0 just fell into place from there. Sean: I’m not sure if this really answers the question, but I think one of the things fans will enjoy, aside from character interaction, which is important to the story and the characters, is that every character walks out of the event a little changed by the experience. Which probably took the most rethinking if any, what did they take away from it. Jamal Igle: It allowed us to explore the dynamics between various characters a bit more. Vito, Sean, Ray and I especially have been building this tangential relationship between each of our characters. For me, I had to figure out how Jake would react to Molly and Molly’s point of view. She’s his entryway into the Actionverse world, more than any other character. Remember that Jake comes from a world where superheroes aren’t a way of life and superpowers cause more problems than they solve. So how does he react to this little girl who commands this army and can bench press a Sherman tank? Ray-Anthony: I personally loved the challenge that Jake and Virtue entering the shared universe that Jamal, Vito, Sean and I were constructing presented. Both characters brought their own unique flavor to Actionverse that made it an excellent jumping on piece for all titles. Jake is more of the straight man in a madcap world and Virtue was so stereotypically superheroic that with everyone together….we had the complete spectrum of heroes. Shawn: There was some re-thinking, but nothing that was difficult to agree to. For instance, the man who becomes Cascade. I had plans for where he would wind up through future Fracture stories, but when the concept of Cascade came up, it made perfect sense to sign him over to his new fate! Comic events and crossovers are commonplace in the industry. What sets this apart? Chad: With apologies to Dave Ryan’s War of The Independents a few years ago, we’re not aware of any other publisher that has merged this many creator-owned series into a single shared narrative superhero universe. Certainly the big two, and Valiant, among others, have shared universes in which multiple books or characters exist. But those are all company-owned. We think doing this in a creator owned setting is a new twist on the genre, and we hope it can bring some fresh ideas and keep the interesting stories coming for some time to come. Vito: I’m no John Cassaday. Sean: It’s not an event for an event’s sake, it’s a big thing that has happened and brought these people together so it means something to the characters involved. There’s a lot of heart in this story. Even the villain, Cascade, you can really empathise with his motivations. Vito: I don’t know if there’s anything that truly sets it apart. With the exception of what Chad said, the creator-owned aspect of it, it feels, to me, like something familiar, but not commonplace, if that makes sense. What sets this apart, then, is that no company this small or this early in its publishing history, but not entirely commonplace. That said, I think what sets it apart is that no company this small or this early in its publishing history has ever attempted to do something like this (Actionverse is the tentpole for ALE’s Fifth Anniversary). And also, the level of talent involved. While we’re all kind of in different stages of our careers, only Jamal and Ray have any experience working on crossovers. But I don’t think inexperience shows in any of it. We all relied on each other, and made everything work. I think, at the very least, readers will be impressed with how well this story is told. Steve: The story. The story sets this one apart from other crossover books. 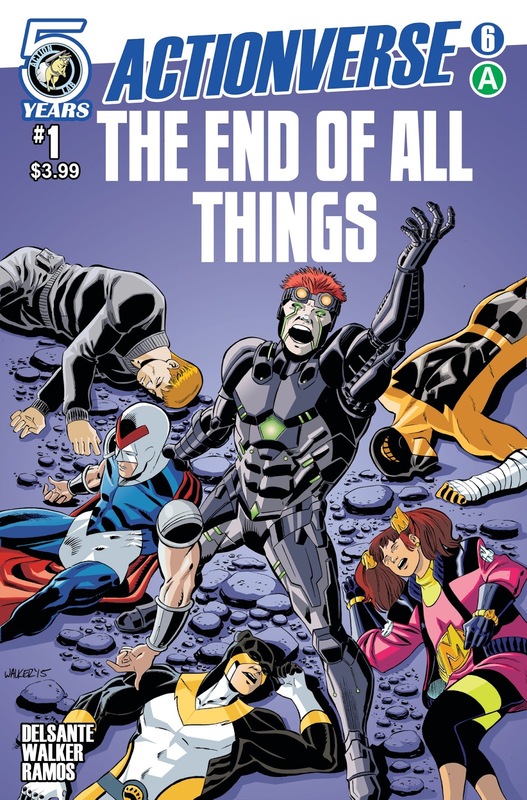 This one has the same feel reading it as Crisis on Infinite Earths, or Secret Wars did. It’s a good story that is well told. That doesn’t happen without all the elements of creators and great characters coming together as well. This isn’t just doing an event because that is the trend. It’s a good story that has purpose that affects all the characters involved. Jamal: If you go into it with that goal, you fail. Stories like these should be entry points for new readers. If it gives people something fun to read and share, and it brings people back to read our individual series after the miniseries, we’ve succeeded. Ray-Anthony: I feel more in-line with what Jamal was saying, but piggybacking on the same ideas expressed about a creator-owned shared universe. This is an entry point. An introduction to a new superhero comic universe that isn’t Marvel, DC, Valiant, or the like. I think we crossed the threshold that current Image’s creator-owned superhero universe was on the verge of, but never truly manifested. Though, giving credit where credit is due, early Image totally succeeded doing what we’re doing now. Despite being plagued with other issues, I often think they are definitely our predecessor. Nate: Besides everything that these guys have said, the one thing that I really like about this whole thing, is that I feel like I can give my 8 year old son every issue of this, and not be worried about what may be in it. Unlike most comics put out by the bigger companies. Shawn: You know, it’s hard to be the last person to fill this out. All the good answers are taken! I’d say what sets it apart is the absolute care everyone has put into this. Everyone respected each others characters, no-one was lobbying to get their character a bigger spotlight. It truly was a collaboration with a lot of heart put into it. Going forward, are there any plans to continue this shared world? Vito: Absolutely. I know that Ray and I have a team up that is already written, and Jamal and I are planning a crossover event with our books. I’m very dedicated to this line and will do what I can to keep it going. Anthony: Jake’s situation makes it a little tougher to just casually do a crossover but never say never. Vito had an idea that I really like and might get pursued down the road. Sean: Every time I see some great indy hero titles, I like to imagine what a Stray crossover with them would be like. And I would like to see what these characters will be like in 50 or 100 issues, how they’ve changed by then and meet up again. What would happen the next time they get together? Steve: These guys are exploring new ground for each of them in a way much like Marvel first did with their characters in the 60’s. Ray-Anthony: Now that Midnight Tiger is definitely coming back, I can finally get back to telling Gavin’s story in only the way that I can tell it. With that said, references and the occasional cameos from Stray and Molly are a definite. Virtue makes such an impact in Gavin’s world that it would be impossible not to mention him, either. Jamal: The first cycle of Molly is already planned out but cycle two will feature Stray and MT, as well as some other team ups with various super characters. Nate: I’m like Steve, I was fortunate enough to go on this ride with these guys, and I can’t wait to see what’s in store for them, and hopefully I’ll be lucky enough to help them along again! 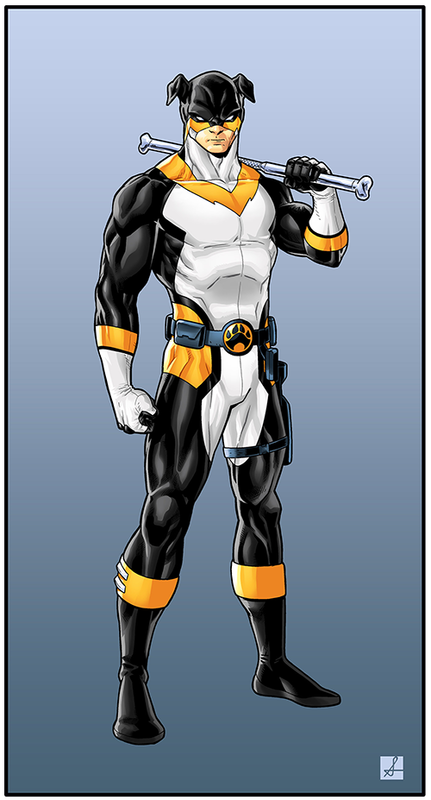 Are there any Action Lab characters other than your own that you would like to explore further either art or writing wise? Vito: I feel like I wrote all the ones I wanted to! I’m looking forward to Black Alpha, Athena Voltaire, Super Human Resources and a few others. I wouldn’t mind having some kind of guest appearance by any of those characters in Stray! Chad: My problem is that I want to draw every new character that comes into the door at Action Lab, as soon as I get a glimpse of the new books. So the better question for me is who I DON’T want to draw, and that list is non-existent. I’m not a fast artist, and I’m working on some personal projects at the moment, but I keep pitching variant covers to lots of folks over here. Sean: Like Chad I just want to draw everyone’s characters. Personally, I’d love to draw the characters of Aero-Girl, cos that book and character designs are fantastic. Anthony: I would love to write a Midnight Tiger arc. Steve: I am the luckiest guy, because I got to play with everyone’s characters a little bit with issue six. If I had my druthers though, I’d love to do a Cascade one shot or mini. I had a blast drawing him! Oh and if Stray and Molly and the whole band made an appearance, I wouldn’t mind at all! 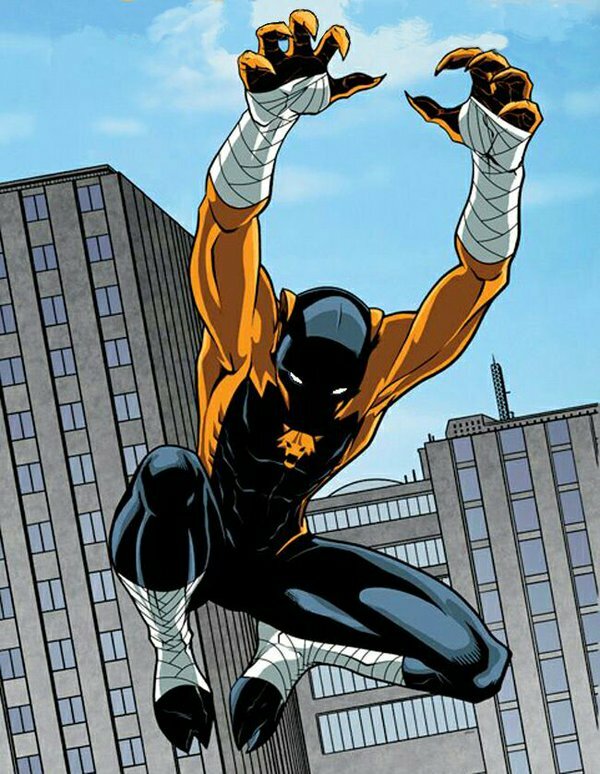 Ray-Anthony: We all liken Midnight Tiger as the Spider-Man of the Actionverse. He’s a character whose adventures can go from street-level to cosmic in a heartbeat. So, dimension hopping to Jake Roth’s earth isn’t impossible. I can also see Austin Briggs in the pages of Midnight Tiger. Not only did I have fun drawing Austin, he and Gavin get along so well! Other characters include Josh Henaman’s Bigfoot: Sword of the Earthman and Ladybug and Cat Noir from Miraculous. Jamal Igle: There’s a few that I didn’t get to play with directly that I’d love a shot at, particularly Stray. Nate: There’s so many cool characters to choose from, it would be a tough choice, but I think it’d be cool to do something Molly centered in my art style, probably with Stray and Midnight Tiger making an appearance somewhere. Shawn: The short answer is “yes.” There’s no shortage of characters Action Lab publishes that I wouldn’t want to get my hands on! Too many cool characters and worlds to choose from. If there’s another crossover, are there any other Action Lab characters you would like to include? Vito: No one knows this. 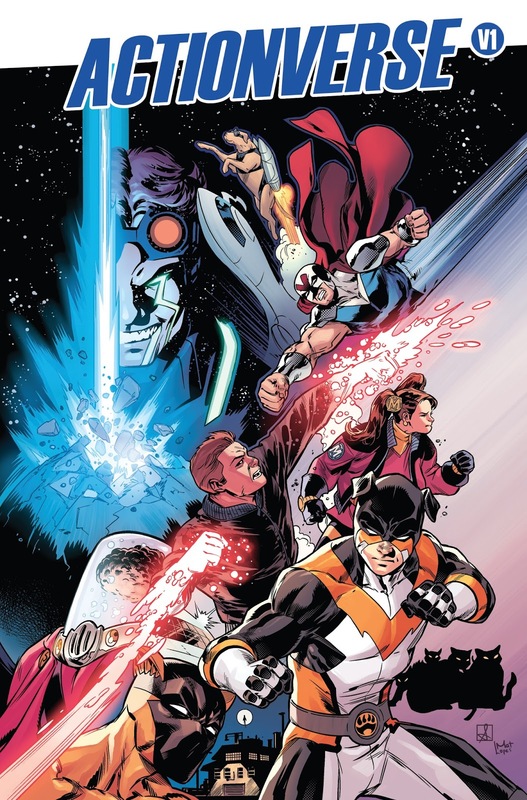 I’ve never mentioned it to anyone, so this is the first time I’m saying this out loud, but I want to have our characters (meaning the Actionverse cast) visit Jeremy Dale’s Skyward world. I dedicated a page in Stray to Jeremy, but I don’t feel I’ve said goodbye to him properly yet. I can’t say if this will ever happen, but I’ve put it out there. If things were different, and Jeremy was still with us, I know he would have been involved in this from Day 1. Nate: I’m positive Jer would’ve been involved somehow. It might have been a stretch fitting Skyward in, but he would’ve been doing something. Whether it was covers, writing, drawing, something. Sean: Did I mention Aero-Girl yet? Ray-Anthony: I’m with Sean. Aero-Girl! Shawn: Super Human Resources is one of my favorite creator-owned superhero comics, so any way we could work that in would be awesome! What’s next for each of your characters? Vito: When we come back with Stray Vol. 2, we’re going to start off with an ambitious storyline called, “The Rottweiler Years,” and while it looks back at his past, it also opens up the next chapter of his present. It’s a very big deal. Not just for the character, and the world (and the Actionverse, really), but for me and Sean, too. Sean: There’s an arc coming up that Vito and I worked very close together on that I’m super excited about. It introduces some new characters and gets pretty intense. But think it will blow the fans away. Aside from that, Vito has plotted out about 17 issues (probably more by now) and just reading the one line description of those issues got me excited. Then we had a Skype meeting and they were even more awesome when he told me more about them. It’s gonna be a fun ride. Vito: Oh, I have the next 5 years plotted out. There is an end point for Stray. The last arc has been plotted, the last issue already written in my head. But when I work with Sean, and we get these…grandiose ideas, I figure out a way to insert a new story arc before that last one. He brings the excitement and enthusiasm out of me; he makes me think and challenges me. I don’t think you can ask for more from a collaborator or friend. 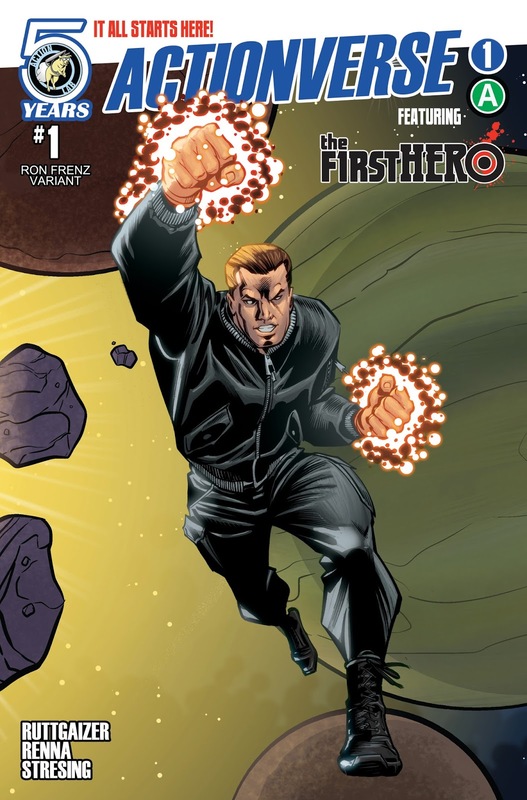 Anthony: The first series coming out of Actionverse is Volume 3 of The F1RST Hero. The story arc, titled Wednesday’s Child, hits stores on Wednesday June 15th. I’ll be running a Kickstarter in support of Volume 3 starting Tuesday May 3rd, so please check it out and help fund the production of The F1RST Hero: Wednesday’s Child. And in case you were wondering, the Diamond Order Code for Volume 3, Issue 1 is APR161130. You should probably order two copies! Vito: That means you have until May 25th to order it! 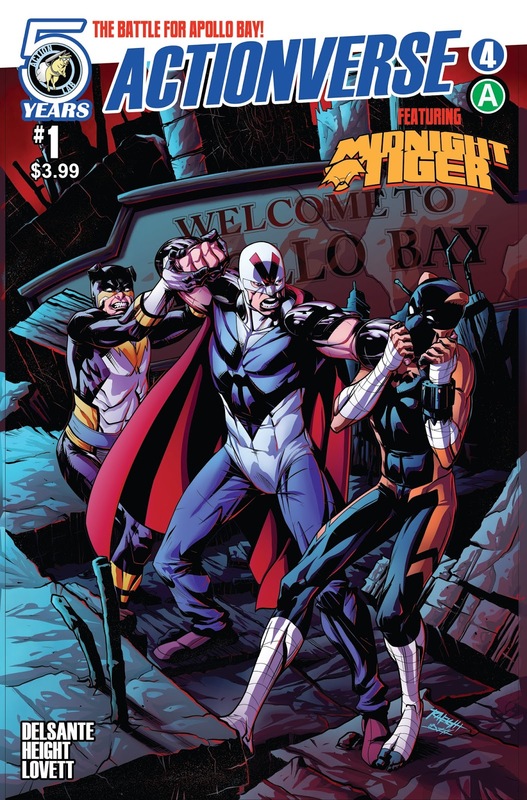 Ray-Anthony: I’m currently working on two things; The long-awaited completion of the Midnight Tiger mini-series for which I’m looking to be done with that no later than August….And I’ll be relaunching Midnight Tiger with a new number one. Since we’re all revealing cool things here about our upcoming titles that no one else has heard about, here are the titles for the first three 12-issue story arcs of the new series; “Nine Lives”, “Beastmaster”, and “King of the Bay.” TEASE!! Jamal: We’ll be getting more into Molly’s life and her relationship to Austin, D.A.R.T. and Coopersville as well as her place in the bigger picture. Shawn: The future of the Fracture characters hinges on Actioverse… and what’s left of them at the end of it. Vito: Right now, I’m focused on Stray, Action Lab: Dog of Wonder (with my co-writer, Scott Fogg) and a new project with Charlie McElvy and Carlos Cabaleiro called The Golden Guard. Less said about that the better, but if you follow me on Instagram or Facebook, you will have seen a few teases already. Sean: Hard to say really, juggling too many things as usual so any of them could lead to what happens next. But I’ll always have my hand in Stray in some form or another. Chad: I’m currently penciling the last issue of Blue Hour, a 5-issue sci/fi series with western influences, set on a human colony on another world. Blue Hour is scheduled to debut This summer as a bi-monthly series under the Action Lab banner. After that, I’m scheduled to begin sequential work on my first project that I’ll be both writing and drawing, tentatively entitled The Null Fairies, which is my adult take on legend of the Tooth Fairy. Anthony: I’m actually going to take a stab at self-publishing after the conclusion of The F1RST Hero Volume 3. I have a handful of projects that I’m working on with various artists including Lee Moder and Carlos Granda and readers should start seeing books from ARISTOCRATS COMICS by the end of this year. The AristocratsComics.com website won’t launc huntil later in the year, so in the meantime you can find updates on me, The F1RST Hero, the upcoming Aristocrats projects and more at my own website, www.ruttgaizer.com. Thanks! Jamal: Outside of Molly, I’m also drawing another graphic novel called Black, created by Kwanza Osajfeyo and Tim Smith 3, as well as occasionally doing cover work. Ray-Anthony: I started working in animation as a storyboard artist recently. So, between that and the new Midnight Tiger series, unless something insanely cool drops in my lap, I’ll just be focusing on those projects right now. Nate Lovett: I do a lot of non comic work, primarily illustration work for Nickelodeon/Random House on Paw Patrol books and coloring books, so there’s those. When I’m not working on those I’m working on my own all ages graphic novel, Champions of Odd Lake. It’s a supernatural adventure book. Shawn: I’m currently writing Puppet Master (based on the Full Moon film franchise), which is an ongoing series coming out through our Danger Zone imprint. I also have several other comic projects in the works, but they’re all still too early to talk about. Besides Actionverse, what is your favorite comic book crossover of all time? Vito: I reread Crisis on Infinite Earths every year. It’s my all-time #1. But my second favorite is an underrated masterpiece called Legends that John Byrne drew, I think, a year or two after Crisis. Love that book. Sean: Again, Vito shows why we work so well together. Legends definitely! After that Secret Wars and the first Superman/Spider-Man crossover blew my mind. Chad: I loved me some 52 and the original Secret Wars. Anthony: Probably the 1981 Superman and Spider-Man Treasury Edition special, written by Jim Shooter and Marv Wolfman and penciled by John Buscema. Steve: I really dug The Sinestro Corps War and Blackest Night. Ray-Anthony: Secret Wars is my jam! House of M is a very close second with Infinity Gauntlet in third. Jamal: The original Crisis is one, JLA/ JSA: Virtue and Vice by Geoff Johns and Carlos Pacheco, Avengers Forever by Kurt Busiek and Carlos Pacheco, Superman/Batman: World’s Finest by Karl Kesel and Steve Rude are the ones that always spring to mind for me. Nate: I always dug the TMNT/Savage Dragon crossover. Shawn: I’m a big fan of the X-Men, so Mutant Massacre and Age of Apocalypse jump right to the forefront. Kingdom Come was a great book, as well. Actionverse #1 Premieres This Wednesday April 13th! #2 arrives on 4/20, issue #3 on 4/27, #4 on 5/4, #5 on 5/11 and #6 on 5/18! Be sure to follow the Actionverse crew on Twitter!